“Kya, I take back what I said, that shot was actually halfway decent,” Letuus winced as his companion pulled free an arrow from his back. “It pierced?” Kya inspected the arrowhead. Sure enough, the point was damp with blue blood. “Not too deep, but it stings like a troll bite,” the marksman hissed through gritted teeth. “Armor off please, I want to properly clean and dress the wound,” Kya ordered. She began rifling through her bag, pulling out medical supplies. “Anything I can do to help?” the gnome, who up until this point had been sitting quietly, chirped as she left to her feet. Her bright pink hair sprung to life. “Not with this, but could you please start the fire and begin setting up the camp? I would prefer we not do that after nightfall,” Kya smiled gently. It would be good to give the girl a task. “Absolutely!” Mikri exclaimed, immediately jumping into action. The gnome excitedly pulled free a few runed stones from her satchel. She set these down in the middle of the clearing before stepping back and snapping her fingers. Orange flames instantly crackled into existence. Letuus, by this point, had managed to unbuckled and remove his mail armor. He stood, undershirt stained in sweat, dirt, and not an inconsequential amount of blood. “Can you remove your tunic as well? There is more bleeding than I anticipated,” Kya frowned slightly, opening up a waterskin. “Ooh, getting steamy eh?” the marksman grinned as he peeled off the shirt. Kya gave him a flat look. Letuus pulled the garment over his head. “Tattoo,” a small voice gasped, immediately followed by the sound of hands clapping over the mouth. Kya and Letuus both glanced over at the gnome, the marksman turning slightly and better exposing his back to the light of the campfire. Indeed, as the girl had exclaimed, Letuus’s entire back was covered in a massive, elaborate tattoo. The top half seemed to be dominated by a series of abstract, interlocking patterns. Underneath this, streaming down like long banners were lines upon lines of script. This writing, which appeared to be Draenic, tapered down to the small of Letuus’s back. The whole canvas seemed to ripple like waves on the sea, and not just due to the flickering light of the fire. The marksman’s very skin was etched and scarred underneath, in patterns that did not align at all with the ink. “Wow yes, I have a tattoo,” Letuus answered wryly. He still didn’t know what to make of this chipper young gnome. “Sorry – I’m so sorry, I didn’t mean to be rude!” Mikri babbled, turning bright red, her eyes consciously avoiding the ink designs. 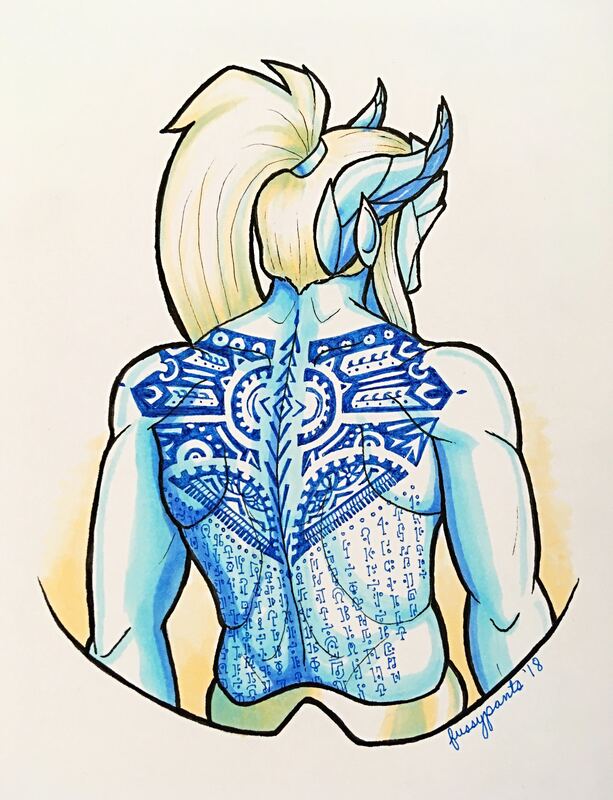 “If you did take offense at people mentioning your tattoo then perhaps you would not have gotten such a large one,” Kya reasoned, carefully running water down the arrow wound. Light began to illuminate from her palms as she began her healing work. “It was a long time before you were born, that’s for sure,” came the quick retort from the marksman. Kya pushed a little less gently against Letuus’s back, causing the man to hiss again. “That was rude!” he exclaimed. “Answer the question and stop being bull-headed,” the paladin chided. Letuus rolled his eyes. “Fine, I got the tattoo shortly after arriving here on this world as a way to remember,” the man glowered. “Remember what?” the irrepressible gnome could not be stopped. “People, places, past oaths, stuff like that,” Letuus replied tersely. “What kind of people, places, and oaths?” Mikri rapidly shot the question back. She had, by this point, circled around to be facing the two draenei, her usually large eyes even wider. 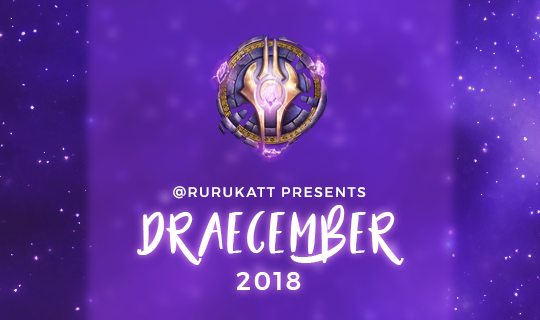 “Is that script Draenic? And what does the top pattern mean? How long did it take to get the whole tattoo?” the gnome was almost vibrating with excitement. “Yes it’s Draenic, no it doesn’t have any particular meaning, and a million years,” Letuus shot back, almost as quickly as Mikri had asked. “Really? It took a million years? I didn’t think draenei lived for that long,” the mage’s eyes shined in admiration. “Oh draenei can live forever, we’re kind of a big deal,” the marksman settled back, crossing his arms. “Forever? So you mean you’re immortal?” Mikri’s jaw dropped. “Yes, we’re immortal,” Letuus smirked, finally feeling back into his element. “Like lobsters?” the gnome interjected. “No, we’re not like lobsters, we’re more like… I don’t know, but something far more majestic than lobsters!” Once again Letuus scowled as the conversation spun out of his control again. “I have just about finished dressing this Lobster Man, can you hold this still while I tie the bandage off?” Kya smiled warmly. She enjoyed the banter between the two of them, it was very amusing to hear Letuus caught off-guard like this. “Draenei are not like lobsters,” Letuus grumbled as he did as asked. Kya finished the wound dressing, tightening it off with an effective knot. She stepped back to survey her handiwork before nodding crisply. “Please try not to stress the muscles in that area for the next couple of days,” the paladin advised. “Yeah, yeah, I know the drill,” Letuus shrugged her off as he pulled over a fresh undershirt. “Letuus, please, you have to tell me more about your culture!” Mikri was practically begging. She stared up at the marksman like a puppy. The marksman let out a long, exaggerated sigh but then, his eyes slowly began to sparkle. A devious smile stretched across his face. “I’d be happy to,” Letuus grinned.